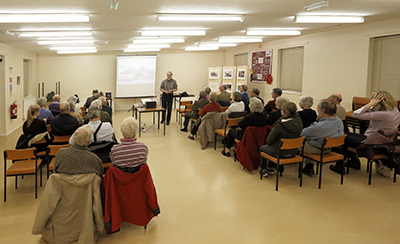 The Club held it's 3rd and final Open Evening of the season on Monday 21st March. Everyone awaited with eager anticipation what was about to unfold from our high profile speaker, John Chamberlin FRPS MPAGB APAGB, from Bristol. John has travelled extensively, visiting over 80 countries during the past 25 years, photographing Nature and Wildlife in their natural habitats. Our journey started on South Georgia in the Southern Ocean, the final resting place of the great explorer Ernest Shackleton. Here many species of birds and mammals were seen such as Albatross and Storm Petrels together with Elephant and Fur Seals, Gentoo and King Penguins. The Russian Icebreaker now travelled further south, to the South Shetland Islands, close to the Antarctic Peninsula. Here huge Icebergs and Ice Sculptures floated past the ship some of which dwarfed the vessel. The wildlife here was plentiful with Weddell and Leopard Seals, Chinstrap Penguins and the Wandering Albatross. Our next visit was north to the Bosque National Wildlife Refuge in New Mexico. Here in December Sandhill Cranes can be seen as well as at dawn, some 25,000 Snow Geese descend on the fields to feed on the grain left for them by the local farmers. Journeying north we come to the famous Yellowstone National Park and the Grand Teton Range, it gets very cold with temperatures plummeting to minus 30 degrees. The only way to move around the park in winter is by tracked Snow Coaches or Snowmobiles. Here life is very hard for the residents, such as Elk, Coyote, Bison and Golden Eagles. There are many hot springs and run offs which the animals can find for some respite from the cold. A view of the Snake River reminds us of the famous photographs taken here by Ansel Adams. We now go east across the Pacific Ocean to Japan, to Honshu. Here in Winter a troop of up to 200 Snow Monkeys bathe in the hot springs to fend off the bitter cold. Journeying north again takes us to the Island of Hokkaido. A paradise for bird photography, many species are found only here, including ballet dancing Cranes, Stella Sea Eagles. Black Eared Kites, Pintail Ducks and the largest of the worlds Owls, the Fishing Owl. Finally we visit Svalbad at the top of the world, on the edge of the Arctic Circle and come face to face with the iconic Polar Bear. Here too Walrus and Reindeer can be found and as the snow and ice recede, many alpine flowers begin to emerge. This had been an evening which few of us will forget and the images will linger in our minds for some time to come.